Identify common terms and tools for gamification. The purpose of this chapter is to provide K-12 pre-service and inservice teachers with a set of guidelines, resources and tips for gamifying their classrooms. Important considerations for adopting a gamified pedagogical approach are provided for reflection and strategies for implementing this instructional method are outlined. Teachers will also be introduced to different tools and technologies they can utilize to help facilitate instruction in a gamified classroom. Finally, examples of gamified teaching and learning are provided in order to help the reader better visualize what gamification might look like in their own classroom. Gamified learning, or the gamification of learning, has been defined as the use of game design elements in non-game settings, such as a classroom, in order to increase motivation and attention on a task (Deterding et al., 2011; Simões et al., 2013). Unlike teaching through the playing of games, gamified instruction is the integration of gaming principles, which is a pedagogical approach that is gaining popularity in the K-12 classroom, post-secondary education, (Domíngues, et al., 2013; Caponeto, Earp & Ott, 2014) private and public corporations (Dale, 2014) and even in our personal lives as we share and track information such as fitness and health goals and accomplishments. Evidence suggests that gamified learning, or the creation of gameful experiences, can impact engagement, motivate target behaviors and drive innovation (Kapp, 2012). There are several testimonials from teachers that have gamified their classrooms on the ClassCraft website (https://edtechbooks.org/-Ay). ClassCraft is a gamified Learning Management System (LMS) outlined in more detail later in this chapter. These testimonials provide a firsthand look at how teachers are able to use gamification to engage their students in a variety of subjects by allowing them to earn points through the completion of various assignments, quizzes, exams and activities. A core component of a gamified classroom is that students are able to choose the assignments they complete in order to earn points and achieve an overall grade. For example, rather than requiring all students to complete the same exact assignment in order to demonstrate mastery of a certain learning objective, they could be provided with a range of assignments (i.e. writing assignment, small group presentation, lab activity) from which to choose. Research suggests that when students are allowed to choose which learning activities they engage with they are more likely to make selections that align with their own learning style, which can make the learning more relevant and meaningful to them (Biggs, 1999). The competitive nature of a gamified learning environment can also serve to motivate students to engage and excel (Nicholson, 2012). Therefore, a gamified pedagogical approach can help students develop their autonomy as learners and customize their educational experience in ways that are conducive to their academic success. In his book, What Video Games Have to Teach Us About Learning and Literacy, James Gee (2014) describes 36 learning principles that are present in good games. According to Gee, these learning principles provide the catalyst for good game design and, in turn, can be used as guiding principles when designing a gamified learning environment. The following are a selection of those principles, along with a corresponding pedagogical strategy, that could be used in a gamified classroom. While evidence of these strategies can certainly be found in traditional classrooms, they are foundational elements of a gamified instructional approach. Good games provide players with information when they need it and within the context in which the information will be used. Creating “just-in-time” learning opportunities helps students make direct connections between concepts. For example, a teacher might create a series of online activities that students can access as needed to complete different assignments. The activities might direct students to external resources such as Khan Academy [https://www.khanacademy.org/] so they can watch a short tutorial video or complete practice activities. The value in this is that students determine what help and instruction they need and when they need it. Quality games challenge players so that they are routinely working at the peak of their abilities and knowledge. Challenging students appropriately keeps them engaged and encourages them to learn more in order to meet the demands of the next challenge. Games, particularly multi-player games, require players to collaborate and work in teams where they have to share knowledge and skills. Creating collaborative learning opportunities can promote cooperation and the development of social skills. Games provide the element of choice, which allows players to decide where to go and what to do based on the tasks and situations with which they are confronted. Incorporating an element of choice in assignments and the educational experience overall makes students feel they have more control over their learning. In addition to these principles, a gamified learning environment should provide students with the chance to unlock different learning opportunities and challenges based on the completion of specified tasks and assignments. This is similar to progressing through levels within a video game whereby the player can only move forward by demonstrating mastery of a specific set of skills. Likewise requiring students to show competence on foundational assignments in order to move on to more challenging tasks can help ensure they are developing the knowledge they need to be successful. Additive grading is another common element in a gamified classroom. With additive grading, unlike traditional grading, students start at zero and work their way up to their desired final grade by adding points earned through the completion of graded work (assignments, quizzes, presentations, tests, labs etc.). This mimics scoring in a video game where players start at zero and accrue points by accomplishing different tasks throughout the game. This approach to grading means that students always have a chance to recover from a low score on an individual assignment or test because they can always do more assignments to earn the points they need. In a traditional classroom, the majority of students believe that on day one of the school year, they start with a letter grade of A even though no assignments have been completed (Ackerman & Gross, 2018). This type of grade entitlement simply does not work in a gamified course for several reasons. One such reason is that students would have no real motivation to try risky or challenging assignments that may have adverse effects on their presumed grade standing. Moreover, if students did complete an assignment but did not earn a desirable grade, they may be more inclined to engage in grading arguments with the teacher because unlike additive grading, traditional grading provides the student with limited flexibility to recover from a low grade. 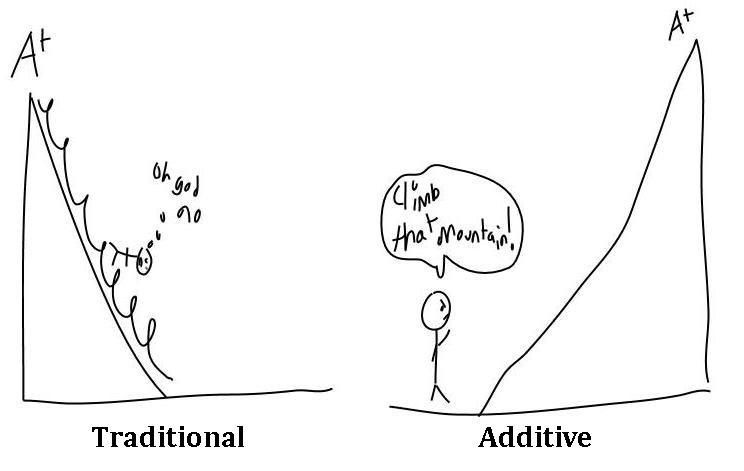 Figure 1 is a visual representation of the difference between traditional grading and additive grading. This is a sketch that was drawn by an undergraduate student enrolled in a gamified, educational technology course for students in a teacher certification program. Implementing a gamified approach to instruction has the potential to impact student learning in a positive way by providing a level of autonomy across assignment choice, easing performance anxiety on unfamiliar assignments through the use of additive grading, and providing embedded tools (e.g. GradePredictor, badges, etc.) to assist students with self progress monitoring (Ryan, Rigby, & Przybylski, 2006). However, it should be approached with caution as there are notable limitations associated with it. First, a gamified approach to learning alone does not guarantee academic success for all students. There will always be a risk that a student will not want to engage in classroom activities - no matter how the material is presented. However, teachers still need to provide effective content instruction that will hopefully capture students’ attention and lead them to mastery of requisite skills and demonstrate competency on grade level state standards. Assignment autonomy for students is one of the most appealing qualities of a gamified approach to instruction but autonomy may be limited due to the mandated learning goals and objectives that will need to be mastered by all students in order to earn promotion to the next grade. Thus, creating a potential limitation to designing and/or offering specific types of assignments within the choice model. In addition to mastering academic standards, there are contextual factors (e.g. resources, class and student characteristics) that may impede successful implementation. For example, adequately implementing a gamified instructional approach necessitates that students have regular access to computing devices as well as a basic knowledge of how to use those devices. Furthermore, annual licensing fees required by many gamification LMS tools may prevent certain schools and/or districts from participating due to budgetary constraints. Lastly, considerations for accommodating diverse learning groups confound the ease of implementation because some students may struggle when assignment constraints are lessened. Today’s classrooms are far from the homogeneous groupings of students that were once prevalent decades ago (Wille, Century, & Pike, 2017). Students of all abilities and learning styles are now integrated and taught within the same classroom making a “one size fits all” approach to instruction outmoded. Thus, teachers must consider how implementing a gamified approach to the curriculum will impact a diverse student population as well as providing struggling students with accommodations. More specifically, students with disabilities and students who are at risk of academic failure may encounter challenges with the amount of freedom and self-regulation required for many gamified environments. One recommendation is to provide ongoing support and training on the LMS and any other technology being used to support gamification. Furthermore, pacing, modeling, and alternative assessment strategies should be considered when implementing a gamified approach to instruction. For individuals who need a highly structured learning environment due to attention or processing deficits, gamification may not be feasible. Structure and explicit instruction are key elements associated with effective instruction for students with disabilities (Israel et al., 2015). Structure within the classroom helps reduce social and environmental distractions that naturally occur during instruction and explicit instruction provides students with concise explanations, which is particularly helpful when multiple steps are required to solve a problem. Another limitation is that not all academic content is conducive to using a gamified approach. For example, subjects like Algebra may prove to be too rote in nature for teachers trying to develop a variety of assignments to fit within a gamified environment. Additionally, practitioners are charged with making sure students demonstrate proficiency on state standards thus not having a lot of flexibility to incorporate peripheral content beyond the mandated curriculum. With such limited options, implementing a gamified approach may prove to be too difficult or at the very least, minimal. Choosing a gamified LMS that aligns with the current teaching style of the classroom teacher, the academic content, type of learners, and the resources available. Once a platform has been selected, the teacher must acquire working knowledge of how the platform operates and more specifically how the various features and options function. It is recommended to start small and increase the use of gamification as one’s experience grows. Determining what LMS features/options to use and then designing assignments around the selected features. Creating a variety of assignments that will appeal to a diverse sample of students but also challenge students. This would include assignments that go beyond what is typically offered (i.e. weekly quizzes, homework, etc.) in most classrooms. Weighting the assignment values so that students have to make a conscious choice of which assignments to complete in order to achieve a desired grade. Also, weighting the values so that students are unable to earn above average grades by only completing the most menial assignments. Self-reflect after each grading period to determine what changes need to be made to the gamified approach to instruction. No matter how much planning has occurred, there will always be elements that need improvement. Make adjustments accordingly and remember, this is a working process. There are many ways to implement a gamified pedagogy into a classroom. Here are some examples to consider that might be useful depending on the goals and objectives of teachers looking to employ gamification in their classroom. Create a badging system to incentivise the development of certain academic skills and competencies. Example: In a science lab a teacher could create a “Lab Tech” badge that students can earn by demonstrating they know how to use the various equipment in the lab. Students earning this badge could be given additional privileges and responsibilities on days where specific lab work was being done such as supervising small groups to insure equipment was being used properly. Promote teamwork and collaboration by creating quests or challenge activities for students to complete in small groups. Example: In a physics or math class a teacher could present students with the challenge of building a bridge out of toothpicks and rewarding the team whose bridge holds the most weight with additional points on the assignment. Provide students with choice in the assignments they complete in order to demonstrate competency. Example: In a social studies or history class where students are learning about a particular historical event or time period a teacher could have students demonstrate their understanding of that event or time period by selecting from an array of assignments including writing a traditional paper, giving a class presentation/mini lesson, producing a podcast or video news report or developing their own Wikipedia style webpage. Utilize an additive approach to grading so that students work to accumulate points in order to achieve the level, or overall grade, they want. Example: A teacher could establish a series of levels with ascending point values for students to progress through as they earn points by demonstrating academic achievement and content mastery. This would allow students to more accurately track their progress and determine what assignments to complete in order to reach their target level (Hill & Brunvand, 2017). These are just a few examples of what gamified teaching and learning might look like in the classroom. As with adopting any new pedagogical strategy, it is recommended that starting out slowly and implementing different elements of gamified learning over a period of time is likely the most effective way to transition to this style of teaching. How gamification “fits” within a specific grade level must be determined prior to implementation. Each tier of K-12 grade clusters (i.e., primary and secondary) present unique advantages and challenges when designing gamified content. For instance, primary grades have advantages over secondary grades for several reasons. First, class size is smaller, which means teachers can spend more time assisting students. Second, students typically remain with the same teacher throughout the day so class scheduling is generally not an issue. Third, by remaining in the same class, students are exposed to the gamified environment on a consistent basis, which leads to a better understanding of how the LMS works and the expectations of the teacher. One notable disadvantage to using a gamified approach to instruction at the primary level is the lack of self-determination and regulation among the students. Teachers may find themselves spending more time on teaching self-determination and self-regulating skills to the students versus academic instruction. Therefore, it would likely be necessary to provide a more narrow range of options to younger students so that while they still have a choice, that choice is constrained. Gamification of instruction at the secondary level seems like a natural fit as secondary students will inherently be more adept at managing the autonomy associated with a gamified approach to instruction due to the increased expectations, pace, and personal responsibilities associated with secondary education. Also, the attraction of infusing technology across the instruction will be enticing as educators continue to compete with personal technology for their students’ attention. While it is possible to implement a gamified approach without relying on a specific set of technologies, it is certainly much easier to manage assignments, track points and assign badges if you have the right tools. Over the last decade, a variety of gameful learning environments such as ClassCraft [http://www.classcraft.com/], GradeCraft [https://umich.gradecraft.com/], Virtual Locker [https://thevirtuallocker.com/], and Canvas [https://edtechbooks.org/-UC] have been developed and are available for purchase. All platforms focus on the facilitation of gamified learning across K-12 schools but with slightly different capabilities and aesthetics. 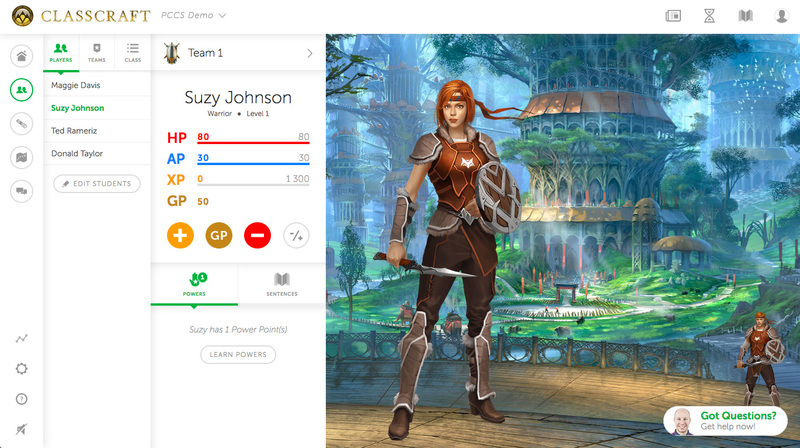 ClassCraft [https://www.classcraft.com/] is a fantasy-themed, game-based classroom-behavior-management tool designed to promote teamwork and collaboration on academic assignments rather than competition among student participants. Each student creates an avatar (see Figure 2) to represent them in the ClassCraft LMS environment. Groups of students work together to gain Experience Points (XP) through positive classroom behaviors and academic achievements. As students level up, they earn powers with real-world effects such as the ability to drop a low quiz grade or the privilege of picking where they sit in the class. In essence, students are able to earn different privileges by accumulating XP through positive behaviors and demonstrating the attainment of defined learning objectives. Students also need to maintain the health of their avatar by monitoring their Health Points (HP). These points are earned, or loss, primarily through positive and negative behavior in class. There are Action Points (AP) as well and these are used each time students exercise a power through their avatar. While there is a gradebook and the opportunity to track academic achievement in ClassCraft [https://www.classcraft.com/], this particular tool seems more focused on rewarding specific behaviors and encouraging students to work in cooperative teams. You can watch a short overview video [https://edtechbooks.org/-uyS] about ClassCraft [https://www.classcraft.com/] to learn more about this gamified LMS. In addition, the ClassCraft 101 page [https://edtechbooks.org/-nvc] has a variety of how-to videos to help you get started and links to free PD as well as a teacher forum. GradeCraft [http://gradecraft.com/] incorporates a variety of elements of gamified learning including additive grading, where students start at zero and advance through levels (Figure 3) by earning points via the completion of assignments and other graded tasks. Assignments can also be structured such that the successful completion of one assignment will unlock, or make available, subsequent assignments. 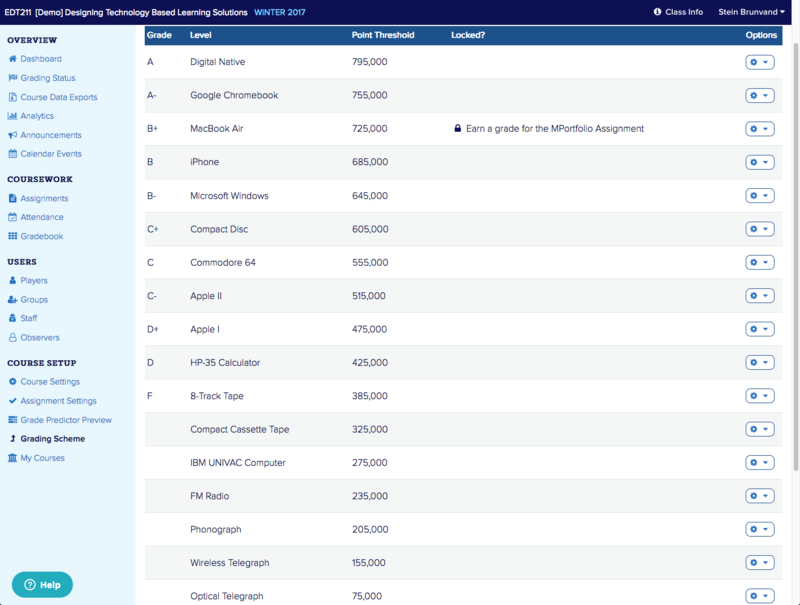 Figure 4 shows a sample list of assignments from an educational technology course for preservice teachers. 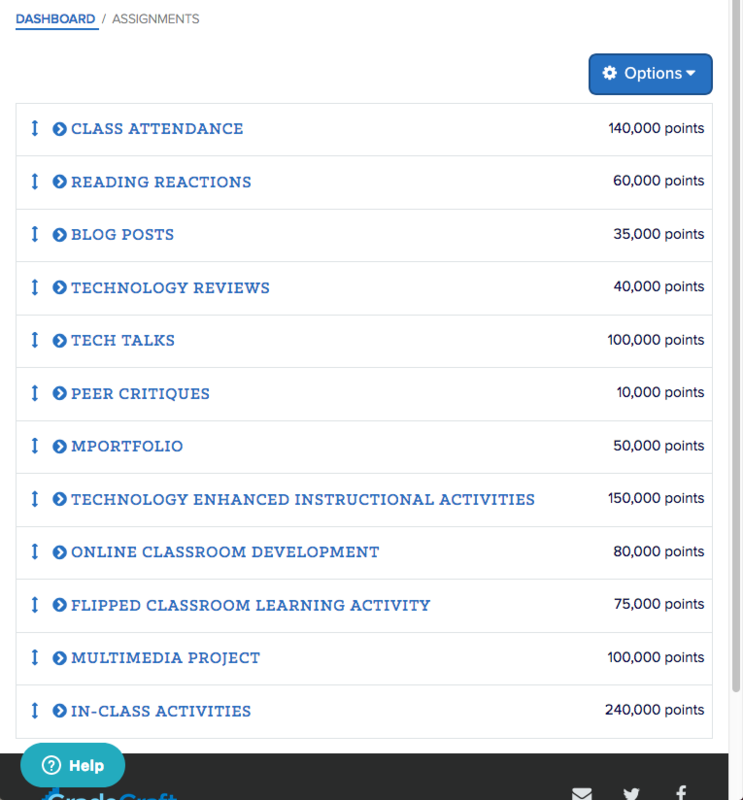 Other gamified elements present in GradeCraft [http://gradecraft.com/] include a leaderboard, badges that can be awarded for exceptional work, focus on mastery learning, the creation of avatars to represent students in the LMS environment, and student choice in assignment selection. The GradeCraft [http://gradecraft.com/] site has a helpful set of resources [https://edtechbooks.org/-svE] that describe gameful pedagogy and the basic elements of designing a class based on gameful learning. In addition, their Getting Started Guide [https://edtechbooks.org/-tEe] provides detailed instructions on how to set-up your gamified class. While these instructions specifically reference the use of GradeCraft [http://gradecraft.com/], they can easily be applied to other gameful LMS environments as well. Virtual Locker [https://thevirtuallocker.com/] (Figure 5) is a cloud based LMS and emphasizes behavior reinforcement by utilizing various individualized token economy systems embedded throughout the LMS. More specifically, badges and “grit” points are awarded for various student behaviors to increase motivation and engagement. Similar to ClassCraft [https://www.classcraft.com/], Virtual Locker [https://thevirtuallocker.com/] targets student engagement and motivation as its primary focus but uses a different approach by individualizing the user’s experience through the use of custom lockers for each student. 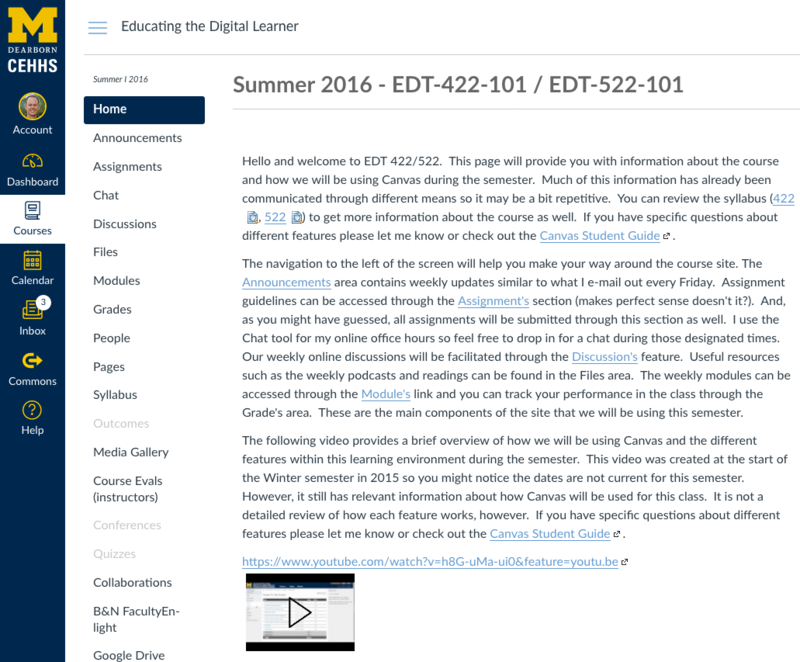 Canvas [https://edtechbooks.org/-UC] has grown in popularity at the postsecondary level with several prominent universities electing to use Canvas [https://edtechbooks.org/-UC] as their LMS. Capitalizing on this increase in popularity, Canvas has expanded its capabilities and can now be used in K-12 education. 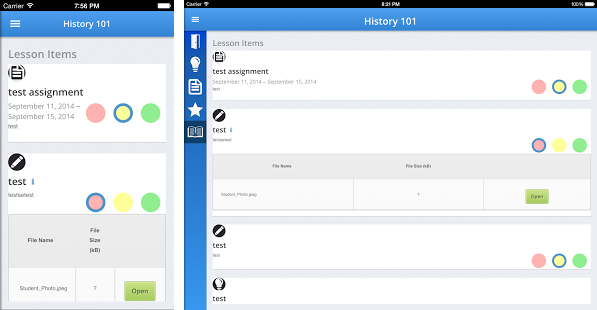 Overall, Canvas [https://edtechbooks.org/-UC] is an excellent tool for practitioners and has a wealth of useful tools to help facilitate instruction, manage assignments and grades (see Figure 6), but is limited in gamified elements such as badges and other motivational tools. It is likely that Canvas [https://edtechbooks.org/-UC] will continue to develop and add new features as demand for gamification tools increases. In addition to assignment choice, badges can be used to increase student engagement when gamifying academic content in the classroom. Aesthetically, badges resemble avatars and can be modified based on the classroom teacher’s needs (Brunvand & Hill, in press). They are awarded to students after specific criteria (i.e. grade or performance) on assignments have been achieved. For example, a student may earn a “participation” badge by exceeding the average level of student participation during a discussion assignment. Another function of badges is to use them as an unlocking mechanism for future assignments or pathways. For instance, once a student has successfully completed five quizzes, a “quiz” badge is earned and a new assignment is unlocked. The primary function of a badge is to reinforce the behavior of the student when he or she takes risks and successfully completes various assignments. However, be strategic in how badges are used because when used too often, they may diminish the intrinsic motivation of students on other assignments (Hanus & Fox, 2015). There are a variety of tools that you can use to create badges for your students, which would allow you to integrate that element of gamified learning into your teaching without having to adopt an entirely new LMS. Tools such as OpenBadges [https://www.openbadges.me/], Canva [https://edtechbooks.org/-jMr], MakeBadges [https://www.makebadg.es/], and Credly [https://edtechbooks.org/-otq] are just a few of the tools available to create custom badges. Providing your students with opportunities to take risks without the fear of failing creates an environment of exploration where students are empowered to pursue different pathways to mastery. Implementing a gameful approach to your classroom can also be an effective way to promote active engagement in learning by allowing students to make personal choices about the assignments they complete. While there is certainly a lot of planning and thought that needs to go into the process of gamifying your classroom, the reward of seeing your students motivated to learn makes it worth the effort. Ackerman, D. S., & Gross, B. L. (2018). You gave me a B-?! Self-efficacy, implicit theories, and student reactions to grades. Journal of Marketing Education. Brunvand, S. & Hill, D. (2018). Gamifying your teaching: Guidelines for integrating gameful learning in the classroom. College Teaching, (in press). Caponetto, I., Earp, J., & Ott, M. (2014). Gamification and education: A literature review. Proceedings of the European Conference on Games Based Learning, 1(2009), 50–57. Dale, S. (2014). Gamificationâ€¯: Making work fun, or making fun of work? Business Information Review, 31(2), 82–90. Deterding, S., Dixon, D., Khaled, R., & Nacke, L. (2011). From game design elements to gamefulness: Defining “Gamification.” Proceedings of the 2011 Annual Conference Extended Abstracts on Human Factors in Computing Systems - CHI EA ’11, 2425. Gee, J. P. (2014). What Video Games Have to Teach Us About Learning and Literacy. Second Edition. St. Martin’s Press. Hanus, M. D., & Fox, J. (2015). Assessing the effects of gamification in the classroom: A longitudinal study on intrinsic motivation, social comparison, satisfaction, effort, and academic performance. Computers & Education, 80, 152-161. Israel, M., Wherfel, Q. M., Pearson, J., Shehab, S., & Tapia, T. (2015). Empowering K–12 students with disabilities to learn computational thinking and computer programming. TEACHING Exceptional Children, 48(1), 45-53. Wille, S., Century, J., & Pike, M. (2017). Exploratory research to expand opportunities in computer science for students with learning differences. Computing in Science & Engineering, 19(3), 40-50. David R. Hill is an Assistant Professor in the College of Education, Health, and Human Services at the University of Michigan-Dearborn. He earned his Ph.D. in Special Education from the University of Pittsburgh. His primary research interests are developing effective inclusive evidence-based practices for students with disabilities and examining the use of technologies to improve student and teacher outcomes. 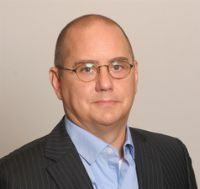 Stein Brunvand is the Associate Dean in the College of Education, Health, and Human Services at the University of Michigan and an Associate Professor in Educational Technology. He earned his doctorate degree in Learning Technologies at the University of Michigan. 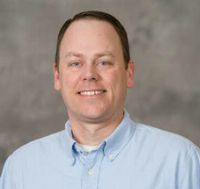 Stein is interested in the enhancement of learning environments through the integration of technology and enjoys working with preservice and practicing teachers to learn about how this can be done more effectively. His recent research has been in the area of gamified learning as well as the development of coding curriculum for students with disabilities.